We all tend to think more about security and safety in the home as we get older. But this is something we should think seriously about at any time, and at any age. In this piece we take a look at making the doors at home safer and more secure using mechanical door closers. You might be wondering why bother with such devices. Well, door trapping can result in serious incidents. Sadly, this is one of those preventable accidents that happen far too often. It’s a particular problem with toddlers and kids, but anyone can become a casualty. Badly crushed hands and fingers can change lives forever. OK, let’s now move on to the frequently asked questions section. Q. What Is a Door Closer Exactly? A door closer is a special mechanical device that fits to a door. Its function is to ensure the door closes after someone has opened it. Not only do they prevent you from opening a door too fast, they also close the door slowly and quietly after use. Whether pushing or pulling a door to open it, the more mechanical control there is, the safer it becomes. Q. Why Use a Door Closer? One of the main uses for door closers, particularly in commercial buildings, is to make sure the fire door remains shut at all times. There are all kinds of reasons why a closed door, and doors that close in a controlled manner, are useful. Doors that can’t “SLAM” shut can prevent a lot of accidents, most of which happen in nanoseconds. You can adjust most door closers so that they match your needs. For security purposes, door closers are helpful because they ensure self-locking doors, like the front door of a home, closes and locks after you’ve gone through it. There’s another good reason to keep doors closed, and that is they contribute towards better energy efficiency. Closed doors help to keep a cool room cool and a warm room warm, thus saving on energy bills. The smaller door checks, or dampers, are ideal for use on lighter structures. These are simple devices that prevent that hard, fast slamming action that causes so many accidents. And finally, door closers create some resistance to opening forces, and thus help to control the rate of closing. This can be particularly helpful for say the infirm or disabled who need more time to move through open doors. Q. How Do Door Closers Work? Overhead door closers are quite simple devices that attach to the top of a door and its frame. They typically have one of three types of controlling arm attached to the mechanism. These are the regular arm (standard), top jamb and parallel arm. They work by storing energy in the tension springs as the door opens. The energy in the spring then releases as you let go of the door, forcing it to close. The attached arm controls the rate of closure. Most home mechanisms have an air piston of some sort that prevents the door from slamming shut. You can sometimes here a gentle hissing sound as the door closes, which is the air releasing as the piston contracts. Q. Where’s to Use Door Closers in the Home? Any door that you feel will benefit from a door closer is candidate, including garage and shed doors. Different types of door will need different solutions though. Slamming doors can also cause destruction, either breaking the door or things close to it. Make sure you know whether your doors are flush, projecting, recessed, or sliding before you go shopping. Remember to consider the security aspect as well as the safety. 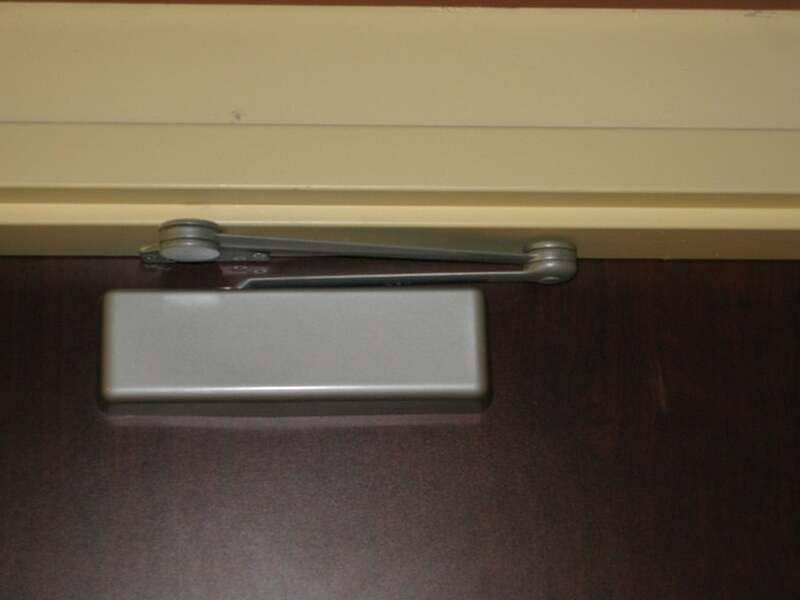 A common use for door closers is with the inside doors of a home. It’s important to point out that not all door closers, or door checks and dampers, are equal, just as doors can also vary. The type of mechanism to use will depend on where there door is, its weight, type, and your control requirements. If in doubt, speak to a professional and let them help you to make a better informed decision. Think about the energy saving aspect too. Back in my day, parents would ask me if I was born in a barn every time I failed to close a door after opening it. What they were really complaining about was the fact that I was letting the heat escape in the winter. Either that, or I was letting the hot air come into an air conditioned room in the midst of summer. When your doors close gently and automatically, this is one less headache to worry about, and you’ll make savings over the long term too. Think carefully about which doors you want to use closers on if you have kids, especially youngsters. Slamming doors can BANG SHUT in the blink of an eye, and that’s when most accidents happen. When the doors close slowly and shut gently, trapped hands and fingers are much less of a problem. Think too about the other precautions you can take to make doors safer in the home (see opening introduction). If your interior doors are light enough for door checks or door dampers, use those instead. They’re easy to fit and less expensive than the heavy duty closers. They will also put an end to those almighty BANGS that worry the life out of parents every time they hear one. Q. When Should You Consider a Door Closer? By now you will already be familiar with the reasons for using door closers in and around the home. There are, however, three situations that you will want to pay particular attention to. The worst injuries of all tend to happen most among the latter age group (10-13). Kids in this age range have a higher proportion of amputations as a result of their injuries. For some reason, boys are more susceptible to serious injury than girls. Aging—we don’t like it, but it’s an inevitable part of the life process. For many, a more forgetful mind is all part and parcel of growing older. Leaving doors open is a concern for security as well as safety. Door closers on self-locking doors will give some peace of mind in these situations. Not having doors slam shut in the face or back of seniors is another benefit. After all, the older one gets, the slower we move and the more fragile we become. This is yet another good reason to consider door closers and dampers in the homes of seniors. Too many people die from house fires, or more specifically the smoke produced by burning. If you have a fire door in the home, it’s vital to keep it shut at all times, otherwise it’s a pointless investment. A good fire door means it takes longer for smoke and flames to get past that door in the event of a fire. A quality fire door will resist smoke and flames for up to 30 minutes. This is clearly marked on the product as FD30. Fire doors aside, even closed standard doors can buy some lifesaving seconds. This is yet another good reason to keep doors shut in the home, especially the bedroom door at night. And with door closers or door checks you don’t have to worry about forgetting. Q. Who Are Door Closers For? If you’ve read through the entire article, you will see that door closers and door checks or dampers, are for anyone who wants to add an extra layer of safety and security in the home. They’re particularly sensible for young families and the elderly. And they can prove indispensable for people who are infirm or disabled, as they make getting around much easier and a lot safer.